Today is the start of London Tree Week, chance to celebrate London’s trees and woodlands with a week of special events including guided walks, talks and activities. Some 150 years ago poet and novelist Thomas Hardy was an architect’s technician in charge of excavating the graveyard in Old St Pancras churchyard. He arranged for gravestones to be removed so work could continue on the London and Midland railway. 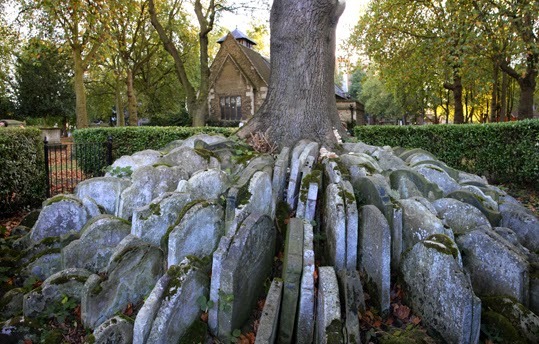 The gravestones were leant against an ash tree, the roots of which have enmeshed the stones over time. The free walkshop is with photographer Peter Coles. The picture above shows the Hardy Tree, but is one taken by myself.